The Blue Ridge Area Food Bank community gathered recently to view the naming of a warehouse freezer in honor of the late Franklin P. Perdue, the former chairman of Perdue Farms. The freezer will be used to store poultry and other types of protein for distribution throughout the Shenandoah Valley. 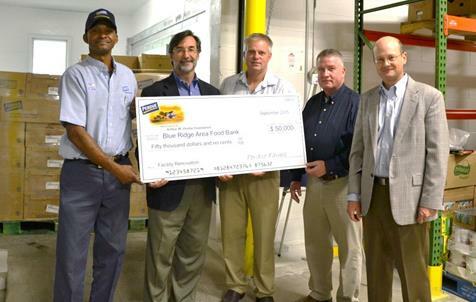 In addition, Perdue donated 10,000 pounds of chicken products and presented a check for $50,000 to help pay for renovations to the Food Bank’s Verona headquarters. Since 2000, Perdue has donated over 1.8 million pounds of food to the Blue Ridge Area Food Bank or the equivalent of more than 1.5 million meals. About the Blue Ridge Area Food Bank: Founded in 1981, the Blue Ridge Area Food Bank is the largest organization alleviating hunger in western and central Virginia. Headquartered in Verona, VA, the Food Bank serves 25 counties and nine cities through distribution centers in Charlottesville, Lynchburg, Winchester and Verona. The Blue Ridge Area Food Bank distributes nearly 24.8 million pounds of food annually to 118,600 people each month through a network of 208 community partners – food pantries, soup kitchens, shelters, schools, churches and other non-profit groups. The Food Bank is a member of Feeding America, a national food bank association that supports 202 food banks across the United States. For more information, visitwww.brafb.org.